This feature is available in the Complete edition of Tamara. Analogous to the Work Amount Uncertainty definitions, this interface allows one to define some descriptive terms to apply to costs. These terms are then applied to resource costs and to expenses. 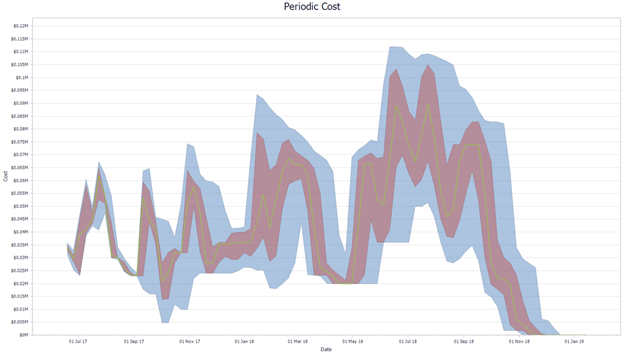 Uncertainty in the resource cost when on standby. The productivity level (the rate with which one can complete the work). The Work Amount Uncertainty feature in Tamara allows one to describe uncertainty in the scope. 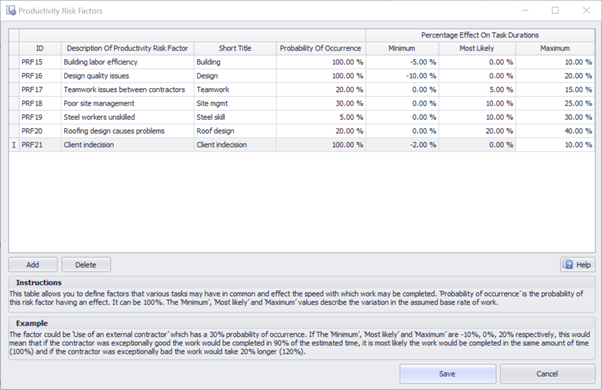 The Productivity Risk Factors feature allows one to separately describe uncertainty in the productivity level. The great advantage of splitting the uncertainty between these two actors is that one can create realistic, intuitive correlation between task durations because – for example – if a welding team works slowly on one set of tasks, it is likely to do the same on another set. The failure to correlate task durations properly will almost always result in significant underestimation of the risk of meeting budgets and deadlines. 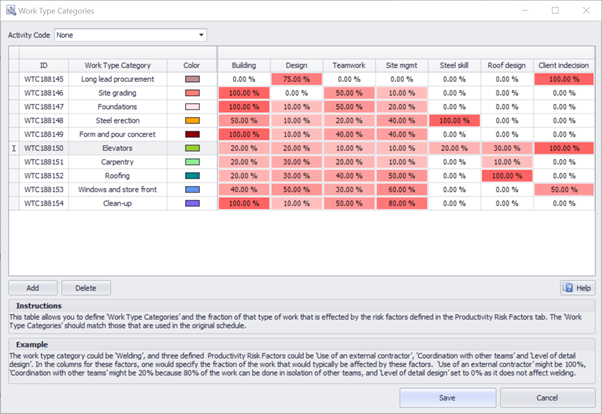 The Productivity Risk Factors are then combined into groups in the Work Type Categories interface. This allows one to incorporate correlation between the uncertainties in task duration. 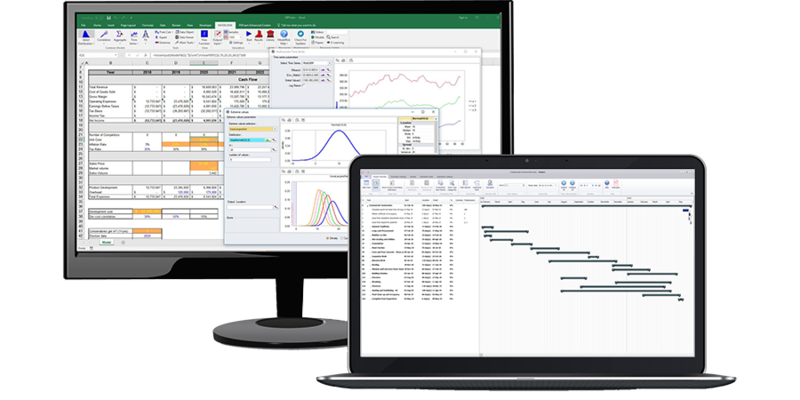 Work Type Categories allow you to group together Productivity Risk Factors to make it fast and simple to specify how quickly work will be done. Productivity rates are a major cause of risk in a project, particularly because they produce correlation between task completion times. The use of different mixes of Productivity Risk Factors for various categories of work makes it very quick and easy to incorporate the uncertainty driven by common factors in an intuitive way. 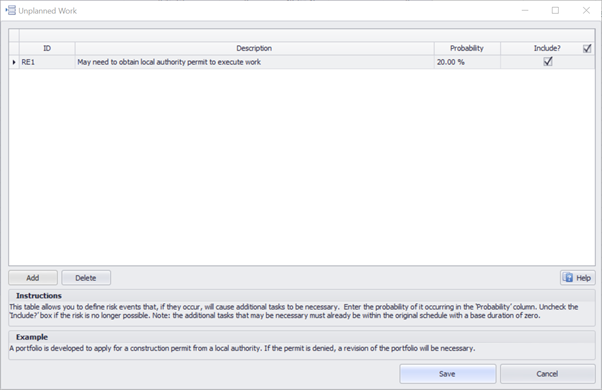 The Task-Specific risk event interface allows you to assign specific risks to one or more tasks. 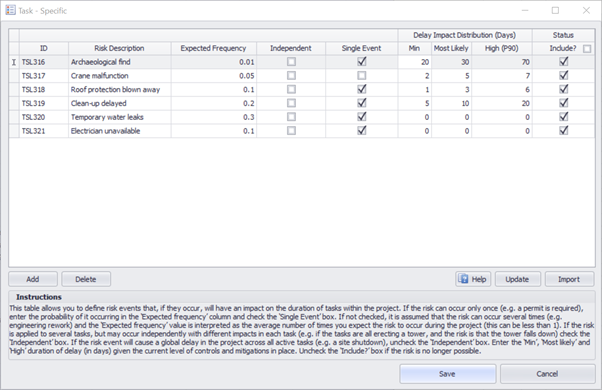 The interface allows you to define risk events with a variety of different characteristics. Those risk events can then be attached to one or more tasks in the main view. 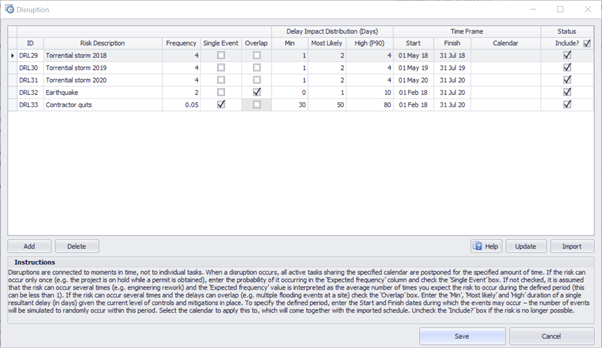 The Unplanned Work risk event interface allows you to insert into a schedule the extra unplanned work that could result from a risk event occurring. In the main schedule, possible tasks are added with zero duration. Then, when imported into Tamara, these tasks are linked to an appropriate Unplanned Work risk event, and given a range of durations should the extra work become necessary. A Disruption in a Tamara model is a risk event that simultaneously halts all activities within the same calendar. Different calendars are often used in project planning to organize the times different types of activities can be carried out. For example, those working in an office might be 9-5, Mon-Fri, all year round and those installing offshore wind turbines might be 24/7 but not in stormy or winter months. Disruption risks in Tamara will impose a complete stop to all activities in the same calendar. So, for example, it can simulate the shutdown of a site or a strike. 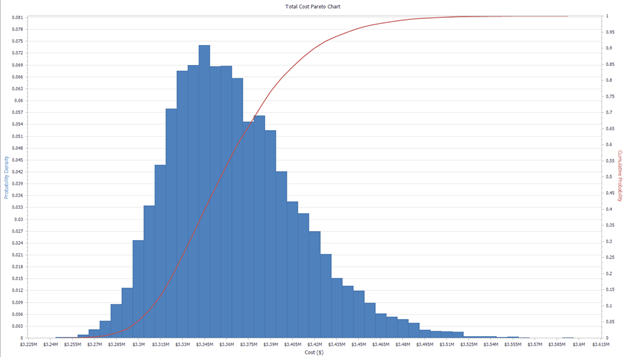 Trend plots show how project costs evolve over time. There are three basic types. 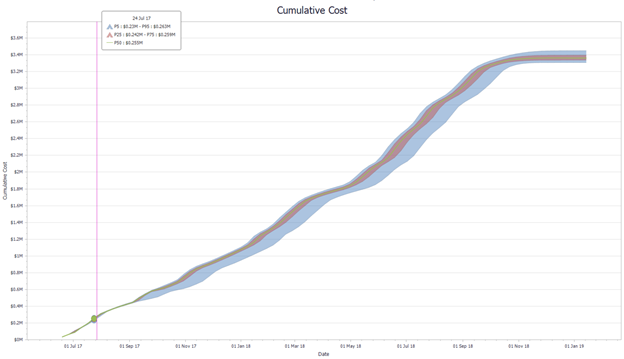 This allows you to analyse the total cost uncertainty associated with any task or group of tasks, or with the project as a whole. 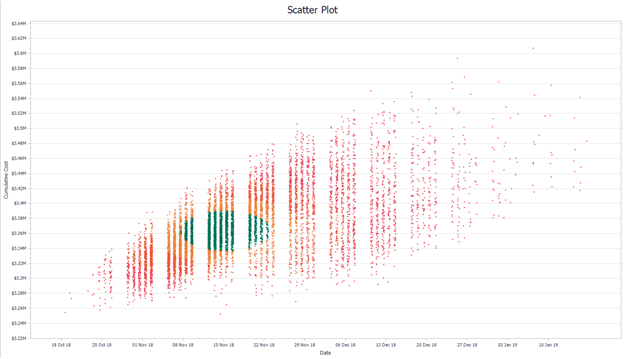 The same plots and sensitivity analysis are available for costs as the ones used for Start, Finish and Duration variables. 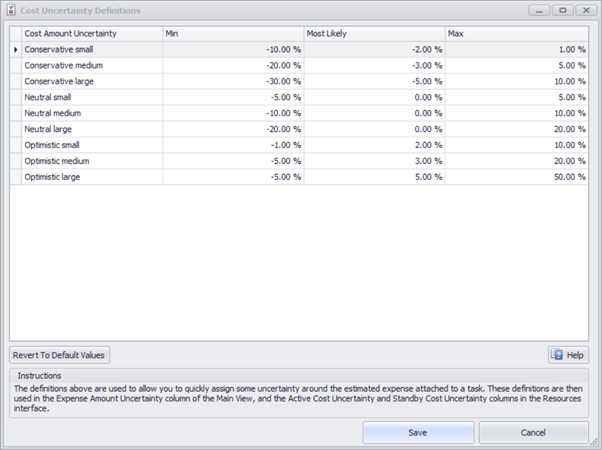 Adding risk and uncertainty to your Excel model.